Aussie Teams fly up for the Bali Masters, Asia’s biggest Footy tournament! 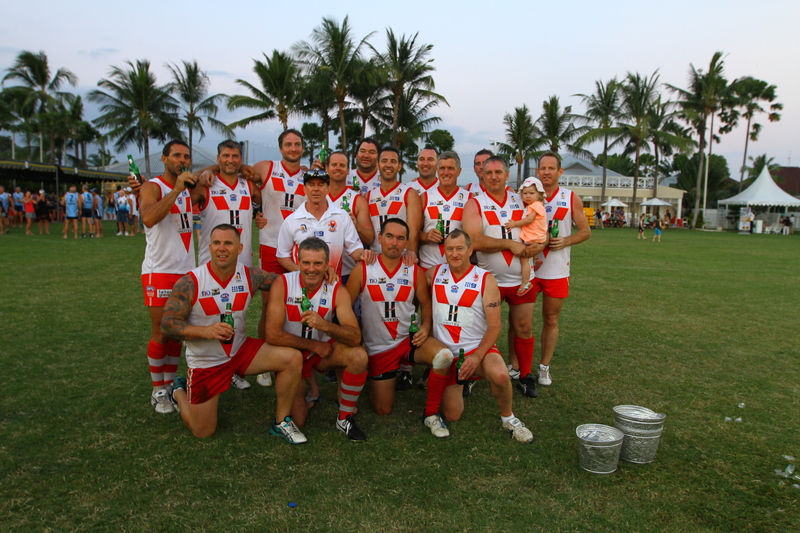 The Aquarius 2015 Bali Masters 9’s AFL Tournament was recently held at the Canggu Club in Bali. Twenty two teams competed making it the largest AFL event held in Asia for 2015. Two full days of footy action were required to find the winners. Over the course of the weekend, 50 separate games of football were played. After the qualifying rounds, the tournament was split into 5 separate divisions. The top 4 battled for the Cup, with the following 4 vying for the Plate. Next 4 on the list competed for the Bowl and the following 4 the Shield. The bottom 6 ranked teams wrestled for the Spoon. 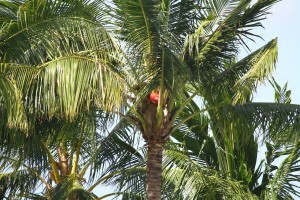 9’s football is a unique version of Aussie Rules that has been developed by the Geckos to accommodate the smaller playing fields in Bali. Teams are made up of 3 forwards and 3 backs who must start the game within the 35 metre arcs at the respective ends of the ground and 3 midfielders who start in the middle. Any score must occur from a kick originating inside the 35 metre arc. The action was fast and furious in this condensed form of Australian Football, but being a Masters competition, participation and fun were foremost on the agenda. The winners of the tournament and taking home the Cup were the Darwin Waratahs. The runners-up were a gallant Singapore Sharks team who were beaten in the final. The Plate division was won by the Northern Warriors Colts from Perth who defeated the Old Dogs from country WA. The Bowl was won by the South Coast Buccaneers from Batemans Bay in NSW and the Shield was won by the Northern Warriors All Stars. The Spoon was taken home by the Melb/Dubai Dingoes. 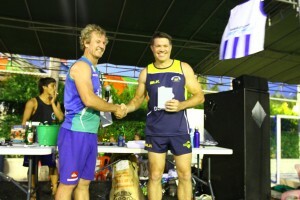 Player of the tournament went to Jim Bury of the Darwin Dugongs who was outstanding throughout the two days of footy. 5 Asian teams were represented at the Competition. Singapore Wombats brought their Masters team the Old Wombats! President Cam stated “Unfortunately the Wombats were grouped in the top tier, and were unable to register a win over the 4 games. Whilst the result was disappointing, the guys were generally competitive and pushed the opposition in each of the games. Congratulations to the Singapore Sharks who also fielded a side and finished runners up in the cup final against the Darwin Waratahs”. A big thank you to all those that participated and assisted and we look forward to welcoming you all back again next year! ◂ South China AFL Finals showcase great competition!